It was no surprise that our boy Jeremy Collins and his partner Tommy Caldwell brought home the W, but they earned the hell out of it. They finished with over 52,000 points, beating the 2nd place team by 10,000 points. Tommy said afterwards that 24HHH was harder than his two-routes-in-a-day El Cap linkup, pretty crazy. His individual score alone beat our combined team score. Damn. I love when you don’t think you can climb something due to conditions, and you somehow rise above, and end up at the chains. Priceless. a wonderful climb, with technical tufa moves, especially as its one of the only natural climbs at the crag. Speaking of routes 5.14a or harder, according to 8a.nu Adam Ondra has done 9 in the past week and a half, with five of them being onsights! 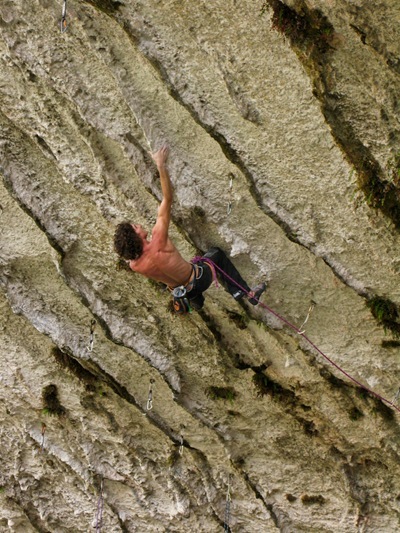 You can read an interview Ondra did with Planetmountain after doing the FA of an old Alex Huber project at Austria’s Schleier Wasserfall, Fugu (5.14d), by clicking here. 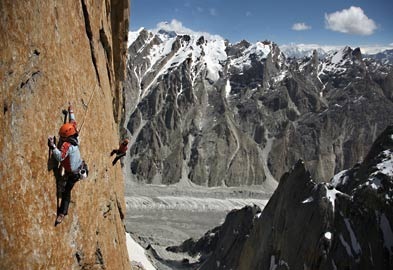 The brothers Huber (Alex & Thomas) were the first to free the route Eternal Flame (VI 5.13a, 650m) on the south face of Pakistan’s Trango Tower. First done mostly free in 1988 by a German team featuring Wolfgang Gullich, the route resisted complete free attempts until the Huber’s unlocked the free climbing this summer. Full details here, here, here and here. Steve McClure recently joined the 5.14b onsight club in Rodellar, Spain…or did he. Paul Robinson and Garbor Szekely repeated Prime Time To Shine (5.14b) at Clear Creek Canyon, CO. Paul then ventured to Squamish with the hopes of repeating Dreamcatcher, but it looks like wet conditions prevented him from even trying. You can read more about Matt Bosley’s attempts on Dreamcatcher here. Legendary American mountaineer Charles Houston, best known for his attempt on K2 in 1953, died last week at the age of 96. Climbing and Alpinist both have good obituaries. Interview with Rock & Ice Senior Editor Andrew Bisharat as well as Bisharat’s interesting take on last week’s Euro v. America debate. Jamie Emerson is compiling is a list of “all of the potentially difficult B3 boulders in America”. An interesting project to be sure, but also a bit overwhelming when you think about the number of unrepeated boulder problems in the country. Rocktoberfest is this weekend at the Red River Gorge. In the interest of protecting the ankles of climbers nationwide I will (most likely) not be attending. The lower part was hard, because they set the holes very far apart so that nobody could climb them. Well, they didn’t count on me! i just want to state that i no longer get news on climbing from 8a.nu because it has turned into such a terrible waste of space on the internet. reading 3 entries on that steve mcclure debate kinda made me throw up in my mouth a little bit. Photos from the 24 hour comp are Here. Thanks for the link Eli , it was a bit hard to find the gallery from that blog, so here is a direct link for the lazy. Oops. Looks like I used an invalid hold! When I came off the route I doubted the grade, not my ascent. I didn’t put myself down as a person that had on-sighted an 8c. News gets carried away and out of hand. Turns out I climbed the route using an invalid hold so the ascent is invalid. That’s fine and makes sense, it’s good to find out. I’m just pissed off that I was led a certain way and didn’t get the chance to on-sight this properly. However, I climbed the route following my nose and the chalk. There was a shrub less than a metre to my right with a well chalked branch and well chalked holds above it. It seemed natural to use it. I guess the only ethic is ‘are trees in or not’. It’s so rare to find them I usually say use what you can, use what nature gives. But that’s funny really considering half the holds there are made of SIKA. There was only one branch that could hold my weight, its not a massive tree. After a shake out I pressed on moving through a bouldery section to the top. I’d been on-sighting 8b’s and up to 8b+ that week and it felt similar to them. The forums make out that I basically climbed up a tree to the belay. I’m not a complete idiot, I’d have known if I’d bypassed the entire route! Though I didn’t see another method I am happy to admit that I might have missed a move, but it couldn’t have been much more than this. But whatever, the rule for this route is the tree is out. The net is good for stuff like this. And where would we all be without 8a to govern us all and tell us right from wrong? thanks narc for the shout out. i’ve read your blog for a while now, so it was awesome to be referenced in your post re: 24HHH. cheers, mate.